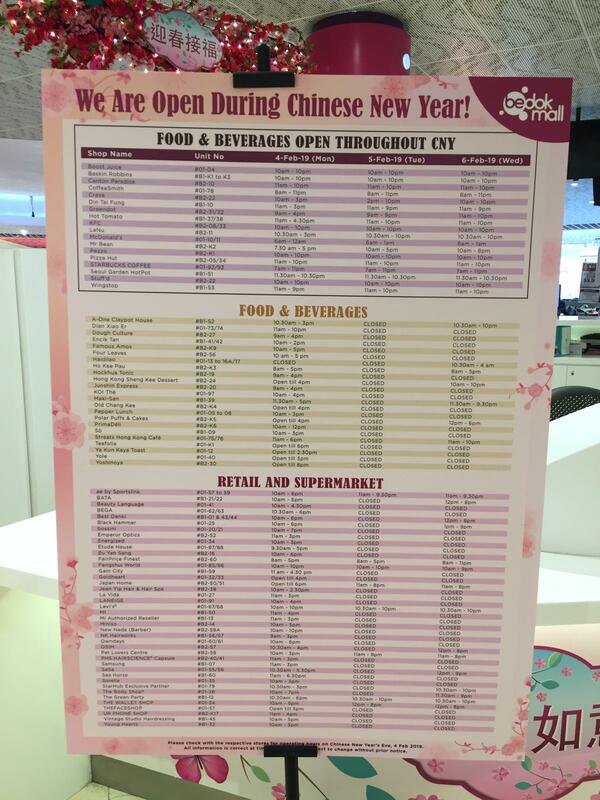 CNY Eve (4 Feb) – 121 out of 146 FairPrice stores to open till at least 5pm. CNY Eve (4 Feb) – Jurong West 962, Punggol Field 108, Hougang 106, King Geoerge 803, Compassvale 263 and Bukit Batok 159 open 24 hours. The rest close at 5 or 6pm. 1st Day (5 Feb) – Above outlets open 24 hrs. Woodlands 678 and Joo Seng 01 till 5pm. The rest closed. 2nd Day (6 Feb ) – Same as day 1. 1st Day (5 Feb) – Most outlets open from 10am – 9pm. 1st Day (5 Feb) – All outlets closed except for 5 popular ones. 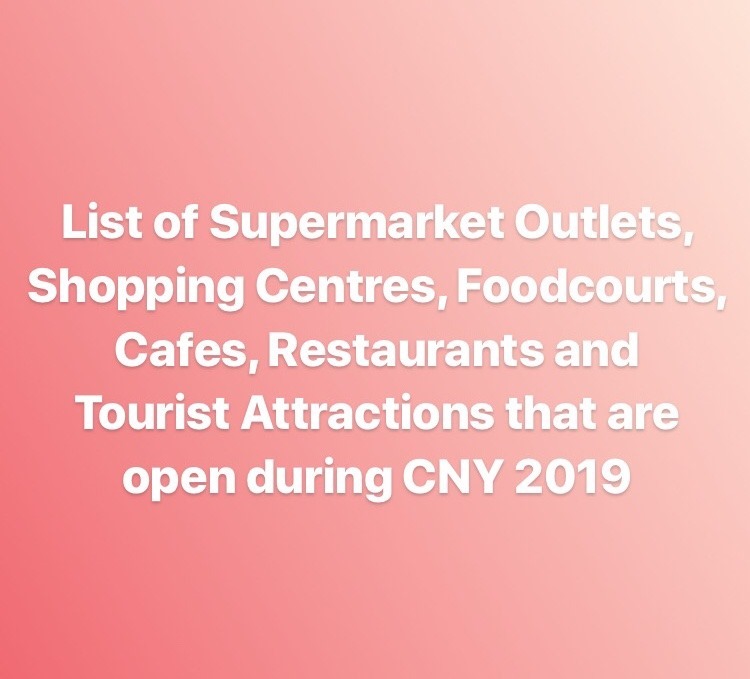 No information available for CNY opening hours of Capitaland Malls such as, ION Orchard, Bugis Junction, Plaza Sing etc, Wisma Atria , IKEA as of publication date. CNY Eve for all outlets open till 5pm. “Order Ahead” function on FR Rewards will be closed from 4th to 6th Feb.
CNY Eve (4 Feb) – All outlets open until 5pm except Lot 1 / One Raffles Place until 3pm. 1st Day (5 Feb) – Bugis Junction, Century Square, Nex open from 10am – 10pm. The rest closed. 2nd Day (6 Feb ) – The above plus Lot 1 open from 10am – 10pm. The rest closed. CNY Eve (4 Feb) – Some closed. Most outlets closing at 3pm. 1st Day (5 Feb) – Most outlets closed. 2nd Day (6 Feb ) – Most foodcourts closed. Most coffeeshops open. 3rd Day (7 Feb) – Business as usual for all except Bukit Batok Driving Ctr close at 6pm. Business as usual for Changi Airport T4, Downtown East and Hougang Capeview. 1st Day (5 Feb) – A few outlets open, on average till 7pm. 2nd Day (6 Feb ) – Similar to day 1. CNY Eve (4 Feb) – Most outlets open till late. Several CBD outlets closing by evening. 1st Day (5 Feb) – Most CBD and office block outlets closed. 24 hrs throughout at Changi Airport, Our Tampines hub and a few others. No information for Coffee Bean Chinese New Year 2019 opening hours as of publication date. 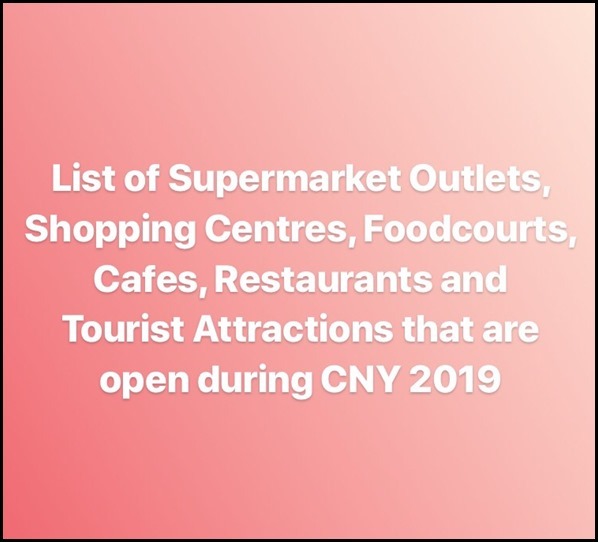 See separate article for cafes that are open during CNY 2019. 2nd Day (6 Feb ) – Largely business as usual. Ling Zhi Vegetarian closed. 3rd Day (7 Feb) – Largely business as usual. Sushi Mieda closed. Closed from 3rd Feb – 7 Feb. Open again on 8 Feb Friday. Based on what I saw pasted at East Point Mall outlet! CNY Eve (4 Feb) – Most outlets open till 3pm. China Sq and HL Building closed. 1st Day (5 Feb) – China Sq, Hong Leong Building and Tanjong Pagar centre closed. Looks like business as usual for most outlets. CBD outlets like Hitachi Tower, Marina Bay Link Mall and Singapore Expo closed during 1st and 2nd Day. 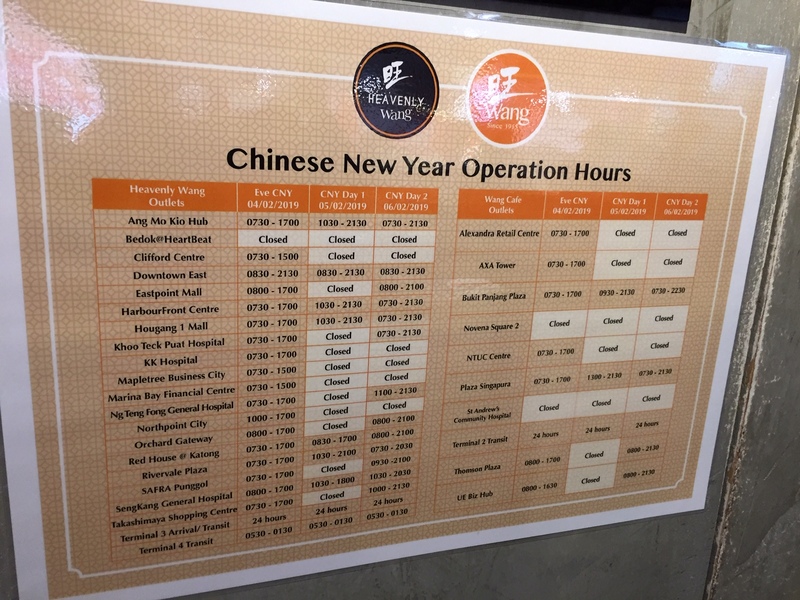 No information on Crystal Jade, Swensens, Subway Chinese New Year 2019 opening hours as of publication date. Information below is taken from Ministry of Health website notice and accurate as of 1 February 2019. Please contact the GP clinics to check that they are open before visiting.